What you do is paint the professional strength whitening gel on your teeth, and then you use the mouthguard so you don't absorb the gel into your lips. 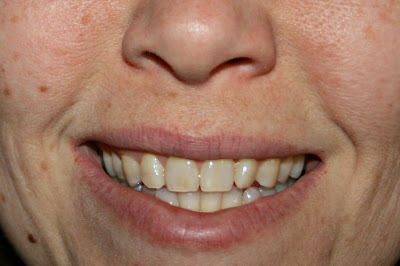 Over that, there is a blue LED light you can use to further the whitening process. It can be used daily, for 20 minutes to 2 hours at a time. I used the teeth whitening kit for 8 days at 20 minutes a day before taking this picture. I found it easy to use and convenient in the evenings when my kids were in bed and I was reading. The difference after 8 days is definitely noticeable. I plan to continue using it for another week or two for even more whitening. I took this picture with no makeup and did not edit it in any way other than to crop it. That way you would see my teeth completely naturally. I think they look so much better than they did, and I bet by the end of another week of treatment they will be fanastic (but without being like when Ross whitened his teeth on Friends, ha ha!). 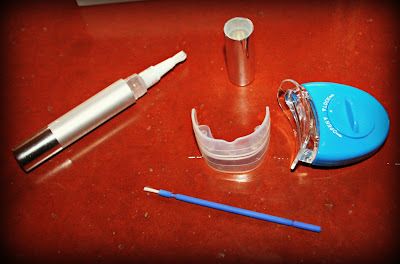 The exciting news is that Smile Brilliant is giving away a teeth whitening set to one reader! Please click on the Rafflecopter to enter. Disclaimer: I was sent a Smile Brilliant teeth whitening set to try for review purposes. The opinions stated above are my own. I had mine whitened professionally by my dentist a couple of years ago. Made a huge difference in how I felt about my smile. I am a coffee drinker so it really does a number on the color of my teeth. This may sound strange, but after the whitening (which is mighty pricey by the way) I started drinking my coffee through a straw just to make the whiteness last. I am considering doing a home whitening kit too! Have to be careful though because over-use can make the teeth hurt/sensitive. Thanks for this post!! I'm not sure my teeth have a chance at ever being white, I drink too much coffee (and red wine!) :-) My teeth are sensitive, so I have never tried whitening, maybe this would work! I think my teeth are way less than white. I need to look into this. My Hubs liked how it worked for him. Happy to see it is working for you too. I like that you paint it on and that it comes with the light! Lookin' good, Lisa. Now, after 8 more days, show us another photo! I've always wondered if those whitening treatments work. Looks like this one does. Thanks for the heads up! I like the idea I could use it at home. Awesome review thanks for sharing. What a great giveaway! I used to use the crest whitestrips and they did a pretty good job. I'd love to try this system out. I like the LED light that you can use with it. So neat! Your teeth look really good! Thank you for telling us about this product! I have a front tooth that was root canaled, and my dentist said whitening won't help that tooth much. I really need a cap. I've been wanting to try whitening with the LED light for awhile! I most like that LED light, it's unique! Looks cool! I like how you can do it for 20 minutes to 2 hours. If I have the patience, I'd like to do it as long as possible each time so that I wouldn't have to do it as many times. I like u can choose your time! I like that is seems relatively easy to use and gives nice results. i like that it looks very easy to use! It looks very professional :) Would love to try! I like tha you can do it at home and get results!